The brooch was perhaps made by Crouzet, who worked for all the major Parisian goldsmiths, producing jewellery of fine quality and original design. He is known to have produced similar pieces in the Moroccan taste. 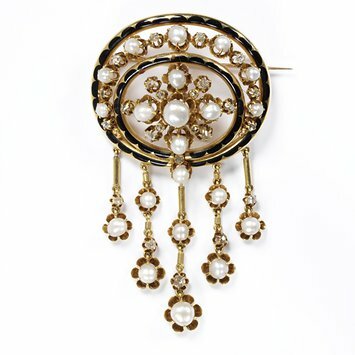 The brooch may also have been inspired by the " moresque " work of the important Parisian goldsmith Alphonse Fouquet. The jewel may have been suitable for wear during mourning. Visitors to the Great Exhibition held in London in 1851 greatly admired the Indian jewellery. Its rich appearance was achieved by combining enamelled gold with dense settings of pearls and thinly cut coloured stones. By the 1860s, as European commercial jewellery lost its appeal in artistic circles, jewellery from the Middle East and India became an important influence. In London, the Art Journal encouraged an appreciation of jewellery from countries such as Syria and Palestine. In Paris, jewellery made in the Moroccan style reflected the French engagement with North Africa. Gold, enamelled in black and set with rose and brilliant-cut diamonds and pearls, with pearl and diamond pendants in the Moroccan manner. Gold open work brooch, enamelled in black and set with diamonds and pearls, ca. 1860-70. Made by or inspired by the Moroccan manner of Crouzet or the "moresque " work of Alphonse Fouquet.